This page describes the third step of creating a restore task with the New Task Wizard. On the third step of the New Task Wizard, you can select data for restoration and where you want to it. In the window, you can see all backed up files and default restoration paths. By default, all backed up data is restored to its original location. If you want to restore the entire backup, skip this step by clicking Next. Expand the tree view, and browse for the data you want to restore. Check or uncheck the boxes, so only the desired objects are selected. You can use Select all and Deselect all buttons. Browse for a folder or file which you want to restore to a different place, and select it. Click Change Location. The Change restore location dialog opens. 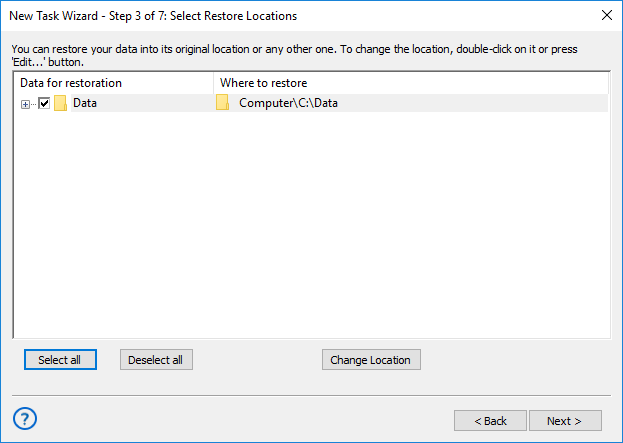 The Change restore location dialog consists of two panes, Data Sources and Restore Location. The Data Sources pane contains data sources. 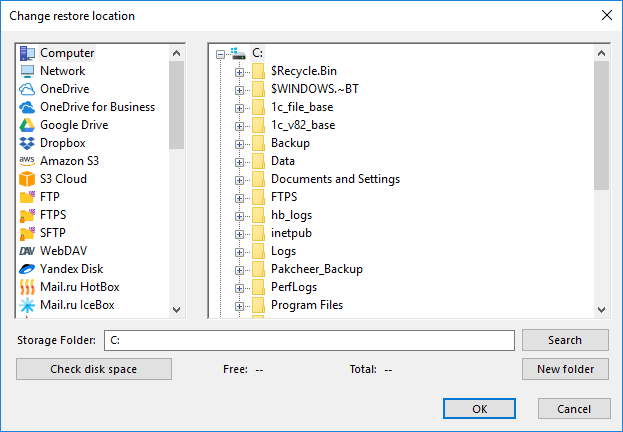 The Restore Location pane shows files and folders you can select as a restoration locations. When selecting a new restore location, you need to select a compatible plug-in. For example, you can’t restore common files and folders to MySQL or Disk Image plug-in. Select a new restore location. If you are changing path for a folder, then you need to select a folder. To change restore location for a file, select a file. Click OK.
Repeat steps 1-3 for each file you want to restore to a different place. When selected data for restoration and restore paths, click Next.